← Samuel Taylor Coleridge; a birthday sonnet, and a book! Congratulations, to a most deserving poet and priest. Congratulations Malcolm. I will order. Hope it is available from US Amazon. You speak my language, or rather I try to track with yours. You always write in accents that speak to my condition and nurture my soul. Bless you for keeping us in touch with the Mystery of our faith. Thank you for sharing your beautiful preface, Malcolm. 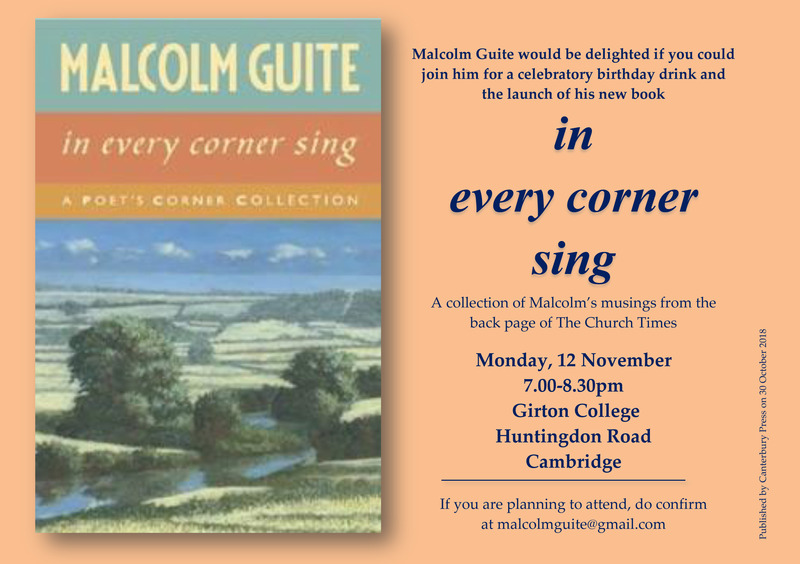 Am on the other side of the world so won’t make it to the launch – but it is sure to be a happy occasion. I wish I could be there, but living in Cornwall, and a serious illness render that wish invalid. However many congratulations and I shall be purchasing the book.